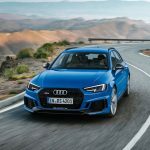 Audi Sport GmbH celebrates the world debut of the new Audi RS4 Avant at the IAA 2017. It combines high performance with tremendous everyday usability. Its 2.9 TFSI engine with 331 kW (450 hp) and 600 Nm of torque makes it the sporty vanguard of the A4 family. The standard quattro drive distributes the power of the V6 biturbo to all four wheels. 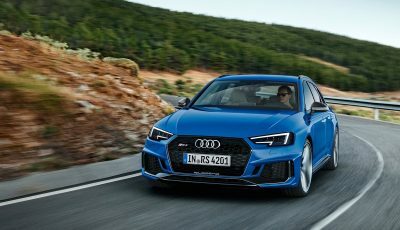 When creating the fourth generation of the Audi RS4 Avant, the designers took inspiration from many motorsport details of the Audi 90 quattro IMSA GTO. Massive air inlets with typical RS honeycomb structure and the wide, flat Singleframe grille define the front end. The optional Matrix LED headlights display tinted bezels. 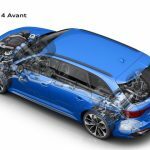 Compared to the Audi A4 Avant, the wheel arches are 30 millimeters (1.2 in) wider and are given added emphasis by the quattro blisters. At the rear end, the RS-specific diffuser insert, the oval tailpipes of the RS exhaust system and the RS roof edge spoiler make for a distinctive look. The exterior color Nogaro blue, pearl effect available optionally from Audi exclusive recalls the first generation of the high-performance Avant from 1999. 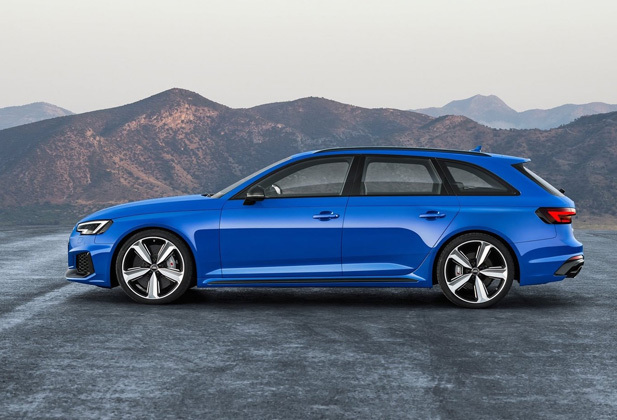 The new Audi RS4 Avant travels on 19-inch forged aluminum wheels as standard; 20-inch wheels are available as an option. 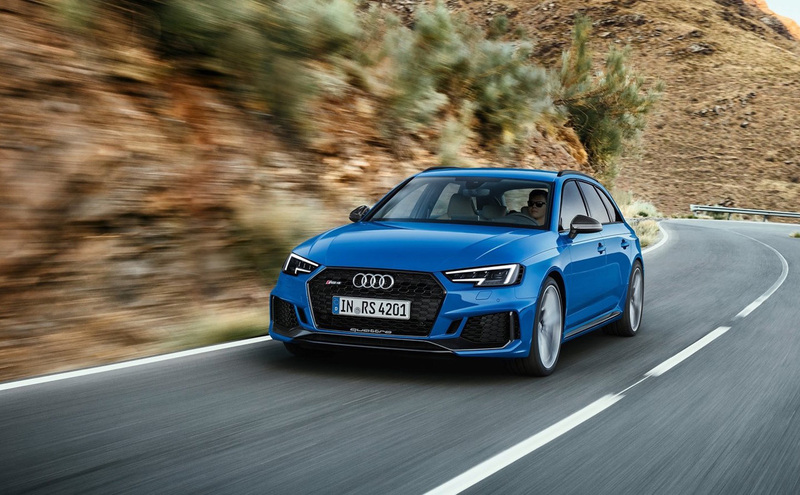 The V6 biturbo develops 331 kW (450 hp) in the new Audi RS4 Avant. Its peak torque of 600 Nm (442.5 lb-ft) – 170 Nm (125.4 lb-ft) more than the previous model – is available across a broad engine speed range from 1,900 to 5,000 rpm. It is key to how the Audi RS4 is able to sprint from 0 to 100 km/h (62.1 mph) in 4.1 seconds. The top speed is 250 km/h (155.3 mph). With the optional RS dynamic package, the top speed increases to 280 km/h (174.0 mph). The power of the 2.9 TFSI biturbo is supplied to the permanent all-wheel drive via a sportily configured eight-speed tiptronic with optimized gear changing. Audi also offers an optional rear sport differential. Average fuel consumption is 8.8 liters per 100 kilometers (26.7 US mpg) (199 grams of CO2 per kilometer [320.3 g/mi]). That is an efficiency gain of 17 percent over the previous model. The new Audi RS4 Avant weighs 1,790 kilograms (3,946.3 lb) 80 kilograms (176.4 lb) less than previously. 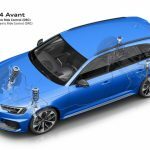 The standard-fit RS sport suspension sets the Audi RS4 Avant another seven millimeters (0.3 in) lower than the A4 basic model with sport suspension. By way of equipment options, there are RS sport suspension plus with Dynamic Ride Control (DRC), ceramic brakes and RS-specific dynamic steering. Drivers can define their own individual personal driving experience using the standard dynamic handling system Audi drive select. 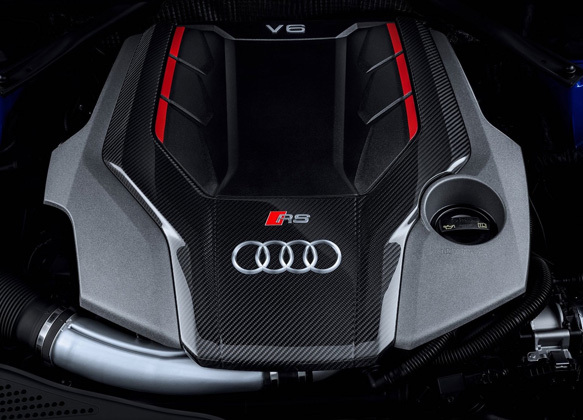 The black interior underscores the sporty character of the Audi RS4 Avant. 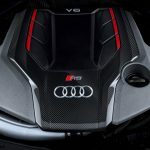 The RS sport seats with optional honeycomb pattern, the flat-bottomed RS leather multifunction sport steering wheel, the shift gate and the illuminated door sill trims are all adorned with the RS emblem. In the Audi virtual cockpit and head-up display, RS-specific displays indicate the g-forces, tire pressures and torque. The styling packages gloss black, carbon with aluminum attachments and carbon with black attachments provide further scope for customization. The Audi exclusive program covers just about any other special request. 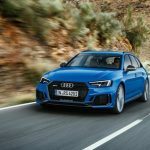 The Audi RS4 Avant can be ordered from the fall onward, before arriving at dealers in Germany and other European countries from the start of 2018. The basic price will be 79,800 Euro….so expect the possible Malaysian price to be in the high RM750,000 or more.